SIALKOT (By Abid Mehdi) A newly-wed couple, Indian groom Parvinder Singh and his Pakistani bride Kiran Sarjeet Kaur, has revealed that their wedding would also help to de-escalate the mounted border tension between the two nuclear neighbours Pakistan and India. Addressing their Pakistani relatives in village Waan, Daska tehsil, Sialkot district here, the newly-wed couple said the war could never be a solution to any problems, as the couple wished to have durable peace around the globe especially between Pakistan and India as well. Indian groom Parvinder Singh said “we have started our happy marital life amid high wishes of durable peace between Pakistan and India”. Pakistani bride Kiran Sarjeet Kaur said “she reached there in India through Samjhota Express for this wedding with the solaced message of peace, love, affection, tolerance and respect of humanity for the world from Pakistan as well”. 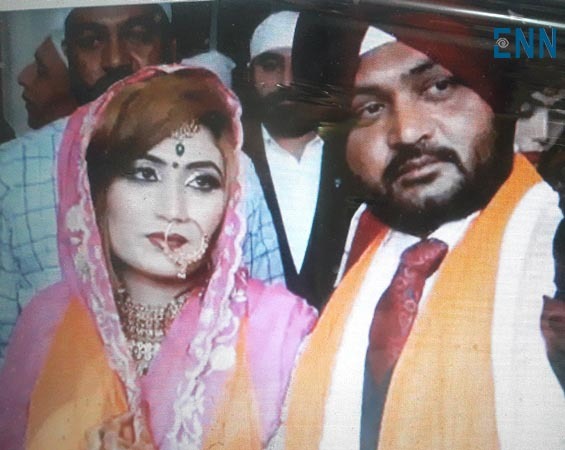 This happy couple told their Pakistani relatives in Waan, Daska tehsil, Sialkot district here that they were much happy after their love and arranged marriage, as both (Parvinder Singh and Kiran Sarjeet Kaur) were the close relatives , the cousins, to each other as well. Both Indian groom Parvinder Singh and Pakistani bride Kiran Sarjeet Kaur tied their knot during a special wedding ceremony held at Gurdawara Khel Sahib in Patiala, India on March 09, 2019 (Saturday). Daska based Pakistani bride Kiran Sarjeet Kaur and her family reached Patiala-India by Samjhota Express with 45-day visa for this wedding. 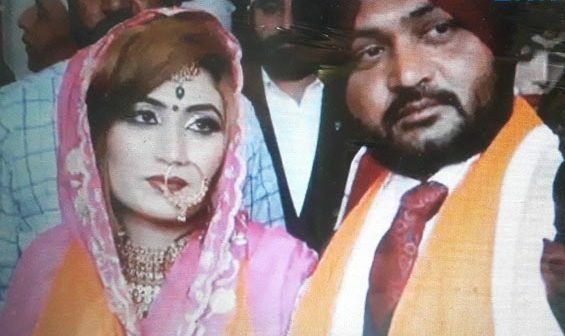 Pakistani national Kiran Sarjeet Kaur (27) married Indian national Parvinder Singh (33) of Tepla village in Ambala district of Haryana (India) at Gurdawara Shri Khel Sahib according to Sikh traditions. Kiran Sarjeet Kaur’s plan to reach Patiala-India on February 23, 2019 got delayed due to heightened tension between India and Pakistan following the terror attack in Pulwama. She reached Patiala on 45-day visa by Samjhota Express on Thursday (March 7, 2019). According to the Indian groom Parvinder Singh, their families had arranged their marriage in 2016(three years ago). He also told the Indian media that his request for a Pakistani visa was denied last year, following which it was decided that Kiran Sarjeet Kaur five other members of her family (including her father Sarjeet Singh and mother Sumaira) will come to India from Pakistan for their marriage. After solemnizing the marriage, groom Singh said his wife Kiran, who is in India on a 45-day visa, would apply for Indian citizenship. Singh is the youngest of three siblings, and Kaur is a distant relative of his aunt, who had stayed back in Sialkot district, Pakistan after the Partition in 1947. They had first met in 2014, when Kiran had gone to India and stayed in their village along with her family, five years ago.